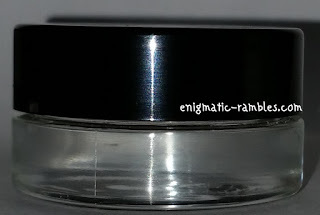 The packaging is a glass jar with a plastic screw on lid, there is a lot of jar without product in. Has a thick glass base which while for the price isn't a problem as you get 2.5g of product it is something to be aware of. 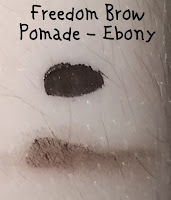 Ebony is the second darkest shade in the eyebrow pomade line, when this first arrived I thought it was too warm and brown toned to go with my dyed black hair. However this wasn't the case, it works fine. I would say this would be good for dark brown hair, it is a little warmer in tone that you would need if you had jet black hair. I like to use this with a dense small angled brush, particularly the one from ELF. I lightly dip the brush in to the pomade which is similar in texture to a gel eyeliner. Then I wipe off the excess on the lid and start brushing it on to the brow from about 1cm in. Bushing it on in hair like strokes. Creating a defined shape and making my brow look fuller. Once I have used most of what was on the brush then I fill in the front part. This lasts all day in the brows, it is easy to work with and you can easily change up how strong of a brow you want with this. I like to set the gel with a powder as this adds more hair like definition rather than purely a block of colour.